Colisa lalia common name Dwarf Gouramie. They can grow up to 5 cm / 2 inches. They are best kept in water perimeters of PH range of 6.0-7.5, and temperatures of 22-26 Celsius / 72-78 °F. 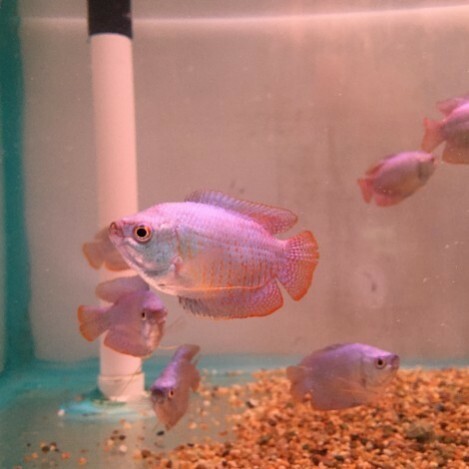 The dwarf gouramie also known as powder blue dwarf gouramie, red dwarf gouramie, blood red dwarf gouramie, and neon blue dwarf gouramie are all peaceful and shy fish. 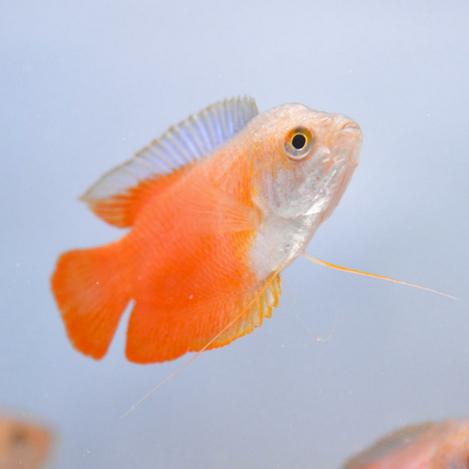 They will mix well in smaller community tanks, but should not be mixed with bigger, aggressive fish. The males are usually a lot brighter in colour than the females. The females are smaller and more silvery. We do find that the males like to boss the females about, so if you are mixing males and females keeping them in a small groups can be better, as too many males can attack the smaller females. Keeping all males together is fine as all males seem to get on well together. Dwarf gouramie only have small mouths so only require small size foods. flake, small pellets, and granular food. Also little bit of live and frozen foods is always good as a treat for them. A colour enhancing food is recommended to keep there colours nice and bright. With dwarf gouramie we only recommend feeding once a day at the most.